Learning how to solve problems on one’s own is something that should be taught from a young age. Critical thinking and decision-making skills will be useful well into adulthood. Helicopter parenting and micromanagement will only lead to a child who can’t choose for themselves. Make sure that they can do just that by providing for space, time, and freedom. Children should be aware of how people see them, and the fact that their actions have consequences. While mental maturity won’t fully allow this until a later stage of development, it’s helpful to start early. Rather than enforcing a strict study time or grade goals, try to get your children to make their own objectives and schedules, to challenge themselves without external pressure or motivation. Failure is an incredible teacher, as we’ve described in a previous blog entry. Teach your kids not to see failure as a wholly negative thing, but rather as a learning opportunity. And when they do make mistakes, show them that you’re not judgmental – otherwise you may make them unnecessarily risk-averse, and afraid of negative opinions. Spoon-feeding your children the answers, whether in their homework or in various life situations, will cause them to become dependent on you. Encouraging independence in this way will help build character, especially in problem solving and self-reliance. Related to this is that children can’t just be waiting on your permission or advice for everything. Teach them that they can make their own decisions and act on them, with just mild supervision. 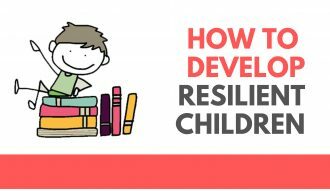 It’s difficult to teach your children resilience if you yourself aren’t being an example of it. Demonstrate to them how you’ve handled your problems in the past. Show them that everyone goes through hardship or trials of some kind, and that people are defined by the way they handle themselves. Hearing nothing but endless praise may create complacent children, or children who don’t know how to handle criticism. Show them where they might have room for improvement. 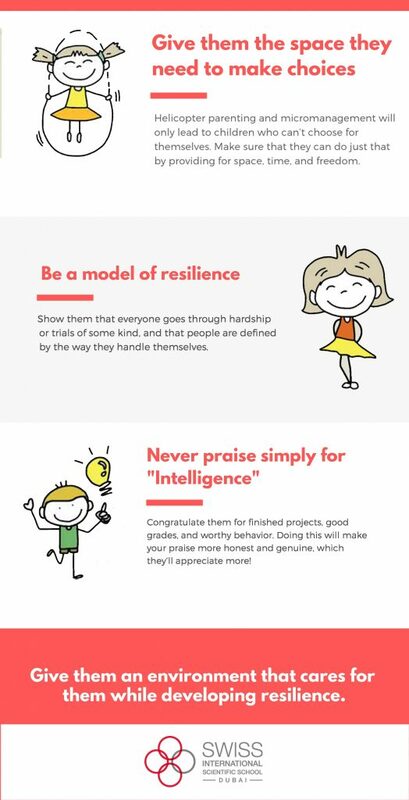 In addition to this, praise children for concrete achievements and character traits, not for some abstract concept of “intelligence.” Don’t always be saying “You’re so smart!” Rather, congratulate them for finished projects, good grades, and worthy behavior. Doing this will make your praise more honest and genuine, which they’ll appreciate more! Some levels of stress and certain challenges may prove too much to bear by simply tackling head-on. Teach your children how to deal with anxiety, how to calm down and breathe deep when faced with a situation that causes them to panic.